From $180,000 pizza trucks to deep-fried crusts, here’s a roundup of openings, innovations and trends in the world of sauce, cheese and dough. Winemaker-turned-restaurateur Frank Altamura uses ingredients from his nearby Napa ranch—tomatoes for sauce, pork for sausages—to make wood-fired pizzas. 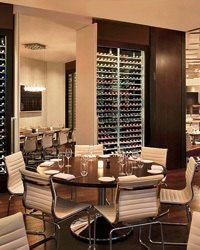 The wine list is all local and includes Altamura’s stellar Sangiovese. 6770 Washington St.; ciccionapavalley.com. Richard Reddington, who runs the elegant Redd down the street, goes casual at this industrial-chic Napa trattoria. The focus is on salumi, antipasti, well-priced wines and rustic pizzas with crispy, ultra-thin crusts. “It’s a place for an impromptu meal or a reprieve from wine tasting,” says Reddington. 6755 Washington St.; redd-wood.com. 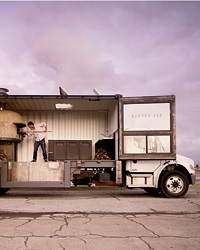 Jon Darsky, a former pizzaiolo at San Francisco’s excellent Flour & Water, has repurposed a 20-foot shipping container to create his impressive mobile pizza restaurant. The setup includes a handmade wood-burning oven from Naples that’s protected with massive air bags during transit. Various locations; delpopolosf.com. Mathematician-turned-chef Jeff Mahin tested 30 dough recipes before he settled on his salty, puffy crust. He’s no traditionalist, topping his pies with purple kale, chèvre and fennel. 2000 Main St.; stellarossapizzabar.com. From the folks behind Umami Burger: fast artisanal pizza. Each pie is made to order, cooks in 60 seconds and costs only $6. 10889 Lindbrook Dr.; 800degreespizza.com. Pizza and cocktails get equal thought at this serious pizza bar. The Neapolitan-style pies pair with cocktails in three categories: Fresh, Dry and Strong. 1134 NW Everett St.; ovenandshaker.com. 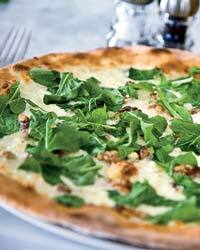 Best New Pizza Places: Local zucchini tops a pie at Garage Bar.© copyright GLINTstudios all rights reserved. Chef Michael Paley, owner of local favorite Proof on Main, serves Italian-meets-Southern pizzas—like Margherita topped with country ham—inside a renovated auto-repair garage. 700 E. Market St.; garageonmarket.com. The wood-burning oven heats to 1,000 degrees, producing a super-blistered crust at this spot behind Parkside restaurant. The chefs spent months developing a special dough to stand up to the heat. 507 San Jacinto Blvd. ; thebackspace-austin.com. Chef Michael Schwartz has always been great with a wood-burning oven; now he’s making pizzas in one at his new Design District outpost. His go-to cheese is Trugole, which melts like mozzarella but is more stretchy and gooey. 3918 N. Miami Ave.; harryspizzeria.com. Chef Tony Mantuano lets his dough rise for 48 hours, which he says makes it lighter. Unusual toppings include goat cheese and dates. 110 E. Pearson St.; bartomachicago.com. Adam Baru worked under restaurateur Danny Meyer before returning to his hometown to open his first restaurant. Wood-fired ovens turn out pies like the Farmers’ Market, loaded with local vegetables. 341 E. Liberty St.; maniosteria.com. Gerard Craft spent time in Italy before opening this new pizza-and-pasta spot. Aspiring pizzaiolos can also buy his pizza flour. 7734 Forsyth Blvd. ; pastariastl.com. Though it sounds like an abomination, montanara, or fried pizza, is a Neapolitan tradition. The dough is deep-fried, then topped and baked, adding a depth of flavor. Last year, Giulio Adriani introduced New Yorkers to the delicacy at Brooklyn’s Forcella; he’s since opened a Manhattan location. 334 Bowery; forcellaeatery.com. Roberto Caporuscio, of New York’s Kesté, has partnered with his mentor, Antonio Starita, a third-generation Italian pizzaiolo. Their pizzeria serves 50 different pies—including fried montanara. 309 W. 50th St.; donantoniopizza.com. The first US location of an Italian chain has three ovens—a wood one for Napoletana, a convection one for Roman-style pizza and a brick one for other styles. It will also be home to New York’s first branch of Scuola Italiana Pizzaioli, Italy’s famed pizza school. 48 E. 12th St.; ribaltapizzarestaurant.com. Hard to believe, but it can be tough to find good Italian food in and around Little Italy. No more: Rubirosa, run by Angelo “AJ” Pappalardo, specializes in a thin-crusted pie that dates back to a 51-year-old family recipe from Staten Island. The Pappalardos also added a gluten-free pizza dough to the menu. 235 Mulberry St.; rubirosanyc.com. Seattle espresso-and-pizza-empire builder Mike McConnell just opened branches of his Caffé Vita espresso bar and Via Tribunali pizzeria in New York City. The Neapolitan-style pizzas have puffy crusts that cook in just 45 seconds in an oven made with imported bricks—from Naples, of course. The house specialty is a stuffed pizza: dough wrapped around sausage, mozzarella, smoked provolone, spinach, cherry tomatoes and broccoli rabe. 122 Ludlow St.; viatribunali.net. This Brooklyn favorite will move to a new, larger home nearby this fall, which will also offer lunch and takeout. This will hopefully cut down on the two-hour waits for the featherlight pizzas. 348 Flatbush Ave.; frannysbrooklyn.com. 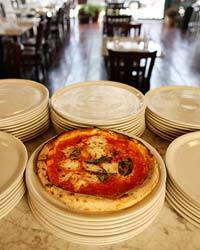 “A perfect Margherita in the spot where, arguably, pizza was born.” damichele.net. “Local ingredients and attention to detail are on par with Brooklyn’s Franny’s.” francomanca.co.uk. A perfectly thin, blistered crust. “Don’t ask for directions; locals want to keep it for themselves and will deny it exists,” he says. 64 Rue Charlot, 3rd arr. “A torrent of bubbling cheese over a thick crust with hardly any sauce.” Avenida Alvarez Thomas 1321. “I came here with a family from Rome, and it was so good, they actually cried.” 2-7-10 Kamimeguro, Meguro-ku. The artisanal pizza boom has spread from coast to coast. Below, a list of our favorites, many run by star chefs who have become pizza fanatics themselves.